Delhi ( hindi: दिल्ली, urdu: دلّی, punjabi: ਦਿੱਲੀ ), is a city of incredible contrasts, combining the ancient and the modern; Old and New Delhi each reflecting the marriage of a modern cosmopolitan complex with the mystical antiquity of India. 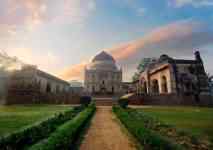 In Delhi you can find the beauty and the dynamism of a city where the past coexists with the present, expressing itself in rich architecture, monuments, museums, galleries, and a diverse population. If you're new to India, ask us about tours, hotels or vacation packages in Delhi. Our staff are experts in this area and will make your trip worthwhile. We love to share Indian heritage with all Canadians. 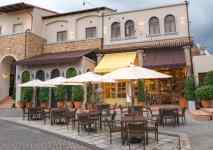 We will not only offer you great deals to Delhi but will also advise you about any questions about the Delhi city as our staff knowledge to Delhi is better than any one else. Book your Flights to Delhi with confidence from Nanak Flights either online on our website or by calling our experienced staff. We have dedicated multi-lingual experienced staff speaking English, Hindi, Punjabi, Tamil, Telugu, Gujrati, Urdu to cater to your Delhi Flights. Delhi is the capital of India and is the 2nd most populous city in India after Mumbai with a total population of over 25 Million. Delhi is the 3rd largest metro city in the World. Delhi is the biggest hub for all airlines connecting to other cities in the Northern India . Most of the tourists going to Punjab, India transit through Delhi for Chandigarh and Amritsar airports. We at, Nanak Flights, offer best deals on cheap flights to Delhi from all Canadian cities including Toronto, Montreal, Ottawa, Vancouver, Calgary, Edmonton, Halifax, Winnipeg, Fort Mcmurray all around the year. Whether you are booking your tickets months before or just a few days before your travel date or last minute tickets, we can get you the lowest pricing for you trip. With the help of our inhouse smart flight booking engine, we compare flights from a large selection of flights from Air Canada, Saudi airline, Jet Airways, Emirates, Etihad, Turkish Airline, Delta, KLM. Air France, British Airways, Qatar Airways, Lufthansa, Swiss, Austrian, Kuwait and many more, and then offer you the best flight options based on your preferences like – travel time and Cabin class. Click here to find the best flights deals from Canada to anywhere in the world. Cheapest fare to Delhi is C$ 1012 departure date: January 22, 2019, return date: February 06, 2019. Delhi (Hindi: दिल्ली); officially the National Capital Territory of Delhi (NCT), is a city and a union territory of India. 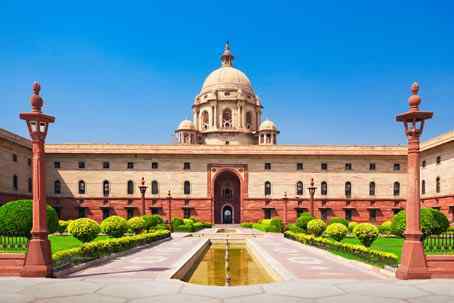 DMS latitude longitude coordinates: 28°39'13.72"N, 77°13'44.29"E. The best time to visit Delhi is between October-March, when the weather of Delhi is unbeatable. This is the best period to visit when the flowers are blooming best and the weather is enjoyable. This is the best time to fall in love with Delhi. Delhi is exemplified by many significant monuments in the city. Delhi is also identified as the location of Indraprastha, the ancient capital of the Pandavas (family of god as per Hindu religion). Delhi has served as a capital of various kingdoms and empires. It has been captured, ransacked and rebuilt several times, particularly during the medieval period & modern Delhi (also known as New Delhi) spread across the metropolitan region. It is a massive metropolitan area in the country’s north. In Old Delhi, a neighborhood dating to the 1600s, stands the imposing Mughal-Era Red Fort, a symbol of India & the sprawling Jama Masjid mosque, whose courtyard accommodates 25,000 people. Nearby is Chandni Chowk, a vibrant bazaar filled with food carts, sweets shops and spice stalls. Delhi and its urban region have been given the special status of National Capital Region (NCR) , includes the neighboring cities of Faridabad, Gurgaon, Noida, Ghaziabad, Neharpar (Greater Faridabad), Greater Noida, Bahadurgarh, Sonepat, Panipat, Karnal, Rohtak, Bhiwani, Rewari, Baghpat, Meerut, Muzaffarnagar, Alwar, Bharatpur and other nearby towns. It is bordered by Haryana on three sides and by Uttar Pradesh to the east. It is the most expansive city in India—about 1,484 square kilometers (573 sq mi). The revamped Indira Gandhi International Airport, situated to the southwest of Delhi, is the main gateway for the city's domestic and international civilian air traffic. The airport was used by more than 35 million passengers, it is one of the busiest airports in South Asia. Terminal 3, which cost 96.8 billion (US$1.4 billion). The Delhi Metro (heart line of Delhi / New Delhi), a mass rapid transit system built and operated by Delhi Metro Rail Corporation (DMRC) serving Delhi, Faridabad, Gurgaon, Noida and Ghaziabad in the National Capital Region of India. Delhi Metro is the world's 10th largest metro system in terms of length. Delhi Metro was India's second modern public transportation system, which has revolutionized travel by providing a fast, reliable, safe, and comfortable means of transport. Delhi is a major junction in the Indian railway network and is the headquarters of the Northern Railway. The five main railway stations are New Delhi railway station, Old Delhi, Nizamuddin Railway Station, Anand Vihar Railway Terminal & Sarai Rohilla. Delhi has the highest road density of 2103 km/100 km2 in India. As India's national capital and centuries old Mughal capital, Delhi influenced the food habits of its residents and is where Mughlai cuisine originated. Along with Indian cuisine, a variety of international cuisines are popular among the residents. The city's classic delight dishes include butter chicken, aloo chaat, chaat, dahi vada, kachori, gol gappe, samosa, chole bhature, chole kulche, jalebi and lassi. Indian Government has demonetized the old INR 500 and INR 1000 Rs. notes. Please make sure you buy new 500 INR and 2000 INR notes at Thomas Cook counter at India Gandhi International Airport, new Delhi. Nanak Flights can provide you with the best pricing on flights and airline tickets to Delhi and all destinations worldwide. Use our search engine to find cheapest travel deals today and compare top airline's pricing from the comfort of your home or office. We have thousands of satisfied customers from Toronto, Brampton, Mississauga, Bolton, Malton, Montreal, Ottawa, Vancouver, Calgary, Halifax, Victoria, Edmonton who have bought flight tickets to Delhi from us. We have also sold hundreds of reverse tickets for journey starting from India (Delhi, Amritsar, Ahmedabad, Mumbai, Hyderabad, Bangalore, Chennai, vadodara, Pune ) to Canada and USA. We have Hindi and Punjabi speaking staff to cater to ticket requirements of elderly people who speak Hindi or Punjabi only. For Nanak Flights, travelers are at first priority, this is the reason we are always in good books of tourist / travelers. We serve them with unbeatable pricing and best travel related information. Our Secret to lowest pricing to Delhi is connecting with multiple suppliers and multiple GDS (Global distribution systems Sabre, Amadeus) to find best flight pricing. If the cost of your air tickets drops after you purchase your tickets from us, we'll give you a 100 credit to spend on the next flight you book with us. NanakFlights constantly works to bring you the lowest airfare to Delhi anytime of the year but the cheapest months to fly to Delhi are January, February, April, May, September, October, and November. Delhi stands proudly as a symbol of the strength, achievements and aspirations of all Indians. The tallest monument in India, the Qutab Minar, is tushered in the new Indo-Islamic architecture that was a fusion of the Indian and Mughal styles, while India Gate is a memorial in tribute to the soldiers martyred in the Afghan War and exemplifies Britsh architecture. City life is rife with festivals and cultural events that will entertain and enlighten you. 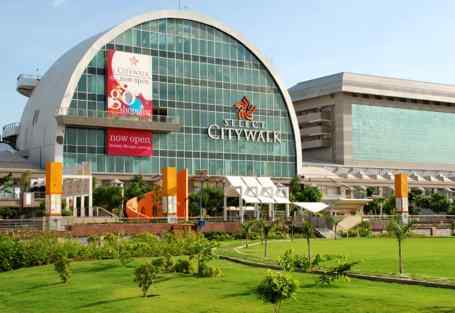 Select Citywalk - One of the best malls in Delhi. One among the top 10. DLF Emporio - They call themselves the India's finest luxury product destination. Pacific Mall - Offers good shopping experience. DLF Promenade - A great place for fashion freaks. Palika Bazaar - If you look crowded places and you know how to bargain well, this is the place for you. Moments Mall - Features shopping, lifestyle, food and entertainment. Art Mall - Must visit for a traveller. Offers unique buying experience if you are interested in art. If you are a Canadian passport holder and does not have OCI card, you need visa for India. Before finalizing your flights to Delhi, please ensure that you apply for visa for India. If you are going to Delhi, India for a maximum of 2 months, you can easily get evisa within 24 hrs. Please note that the maximum validity of e-visa is only for 60 days. e-Visa or ETA for India is very convenient and fast process rather than going to VFS office and waiting for 2 weeks to get regular visa. You need the following documents to apply for e-Visa. You need the following documents to apply for e-Visa. Scanned copy of your passport showing your photo and details. Digital Photograph. Must be in JPEG format. Minimum size is 10 KB and max image size is 1 MB. Photo must show your full face, without spectacles, and with eyes open. USD 50 evisa fee for Canadian Passport holders. 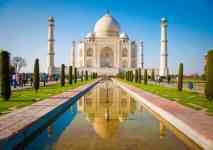 If you are visiting Delhi(DEL) India, Golden Triangle is the most popular Tour Package in Delhi as it covers 3 historical cities of Delhi, Agra and Jaipur. Nanak Flights has the lowest rates for Golden Triangle package. Nanak Flights marked the remarkable growth in serving best Golden Triangle package. Please call our call centre at 1 (855) 722-9977 to find out more about this package. Following are the highlights of Golden Triangle package. Services of English-speaking guide during sightseeing tours. Meet our representative upon arrival in Delhi and check-in at the hotel. 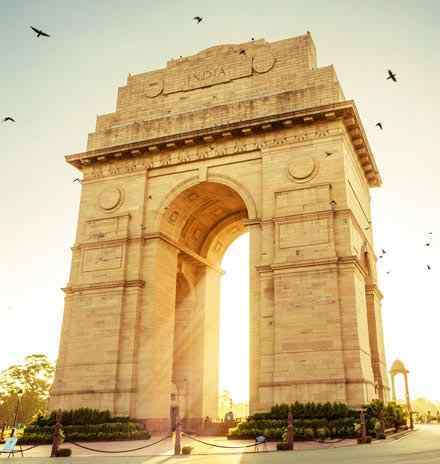 India's capital & a major gateway to the country, Delhi is contemporary and a bustling metropolis which successfully combines in its fold the ancient & the modern. Its strategic location was one of the prime reasons why successive dynasties chose it as their seat of power. New Delhi also reflects the legacy the British left behind. Overnight in Delhi. After breakfast, proceed for a full-day tour of Old and New Delhi. This fascinating city has been in existence since the 6th century BC and has seen ups and downs from the rule of the Pandavas right up to the British Raj. Visit Jama Masjid, which is the largest mosque in India, commissioned by Emperor Shah Jahan. The courtyard of the mosque can hold about 25,000 worshippers. Enjoy a rickshaw ride in Chandni Chowk, the busiest market in Old Delhi…noisy, chaotic and uniquely Indian. You will then visit drive past to the Red Fort, which was constructed during the rule of Emperor Shah Jahan and served as the residence for the Mughal royal family. It continues to be significant till date, as every Independence Day, the Prime Minister makes a speech from its ramparts as the Indian flag is hoisted. Later, drive past to India Gate, President House and several other government buildings in Edwin Lutyen’s Delhi before you head toward Rajghat, the memorial to Mahatma Gandhi. This simple memorial marks the spot where Mahatma Gandhi was cremated in 1948. Thereafter, visit Humayun’s Tomb, commissioned by Humayun’s wife Hamida Banu Begum in 1562. It was the first garden tomb built in the Indian sub-continent where the Persian architect used red sandstone on a large scale. 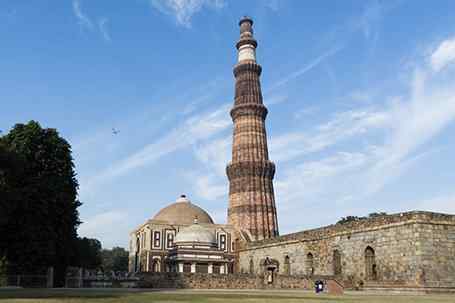 Later in the evening visit the Qutab Minar, which is the tallest brick minaret in the world; it was commissioned by Qutbuddin Aibak, the first Muslim ruler of Delhi. Overnight in Delhi. After breakfast, drive to Agra. Arrive and check-in at your hotel. Later, proceed for Half Day City Tour of Agra. 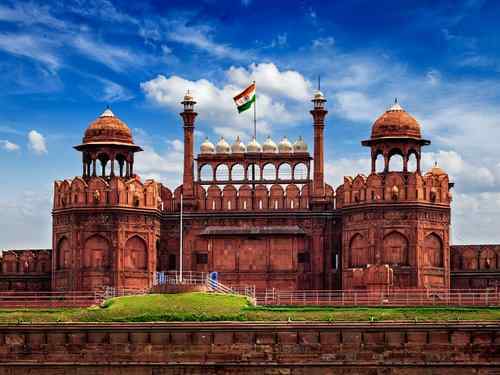 Visit the Red Fort, which was commissioned in 1565 by Akbar. The beautiful yet forbidding structure is a handsome example of Mughal architecture. Later, visit the Taj Mahal … a mausoleum built as a symbol of Emperor Shah Jehan’s devotion to his beloved queen Mumtaz Mahal. Considered an architectural marvel, its construction took thousands of workers over 21 years to complete. Overnight in Agra. After breakfast, drive to Jaipur and enroute Visit Fatehpur Sikri, which was built by Emperor Akbar and is home to many historical buildings. Akbar wanted to make Fatehpur Sikri his headquarters; however, he had to abandon it due to shortage of water. The Tomb of Sheikh Salim Chishti enshrines the burial place of the Sufi saint who lived a religious life here. Today, Fatehpur Sikri is a UNESCO World heritage site. Further drive to Jaipur and check into your Hotel. Jaipur is the gateway to the magnificent and vibrant state of Rajasthan. 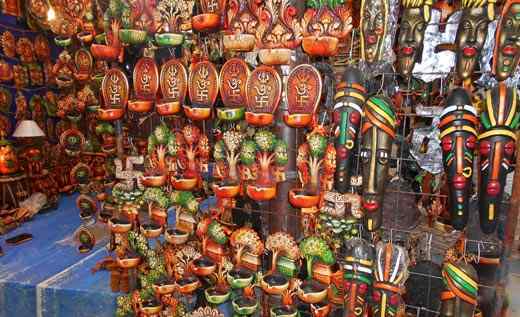 Evening take a stroll in the markets of Jaipur for the traditional dresses and shoes, curio shops, blue pottery etc. Overnight in Jaipur. 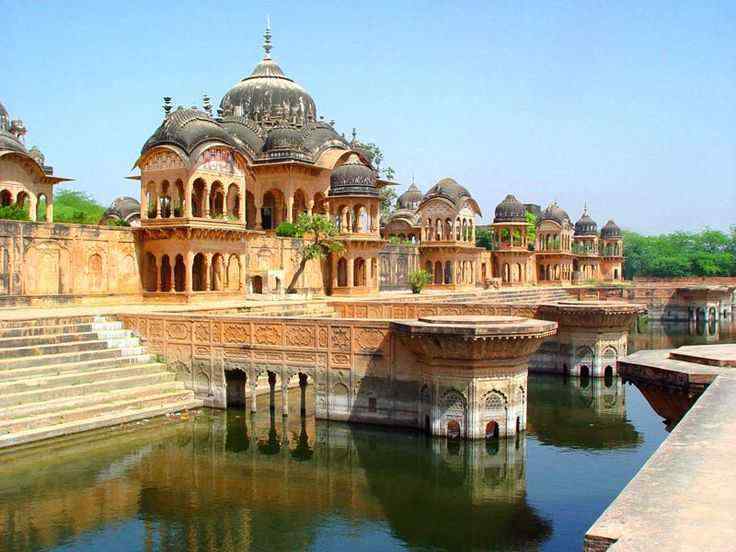 Proceed for full-day sightseeing trip of Jaipur, also known as the Pink City. The city of Jaipur is capital to the state of Rajasthan, famous for its colorful culture, forts, palaces, and lakes. Jaipur owes its name to the founder of the city, warrior king Sawai Jai Singh II. Visit the Amber Fort. 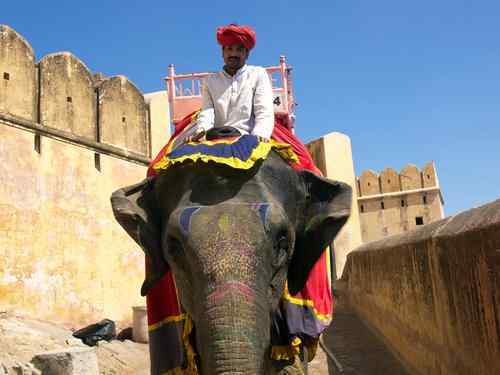 The best way to explore the fort is to ride up to it on Elephant back. Prominent structures inside the fort are the Diwan-i-Aam, adorned with latticed galleries, the Ganesh Pol, with a beautiful painted image of Lord Ganesh, and the stunning Sheesh Mahal, a hall decorated with thousands of tiny mirrors. Later, stop to photograph the beautiful Hawa Mahal, also known as the “Palace of the Winds.” This beautiful façade with its ornately carved latticework windows was designed so the ladies of the palace could look out onto the streets unobserved. Later you will visit the City Palace… again, a synthesis of Rajasthani and Mughal styles. The museums here showcase rare and ancient manuscripts, arms dating back to the 15th century, and costumes of erstwhile royalty. 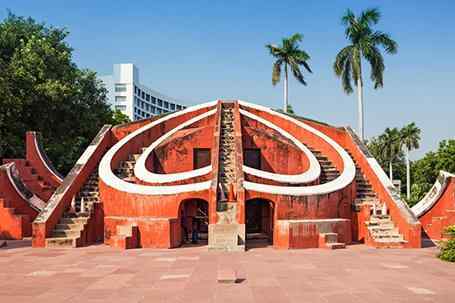 Later, visit the Jantar Mantar Observatory, comprising geometric devices for measuring time, and tracking stars in their orbits. Overnight in Jaipur. After breakfast, you will be transferred to Delhi airport/railway station for return flight back home. Hotels included in the Golden Triangle Package. Price per person with minimum 2 persons. Items of personal nature like laundry, phone calls, tips to guides/drivers etc. For the visual and performing arts there are the Kamani Auditorium, the Chamber Theatre at Triveni Kala Sagam, FICCI Auditorium, the India International Center, Siri Fort, LTG Auditorium, Pragati Maidan and Sri Ram Center. For music lovers, Delhi has the Shankarlal, Dhrupad and Tansen Festivals in February and March and the Vishnu Digamber Festival in August, featuring India's greatest musicians performing Roshanara Festivals of music and dance organized by Delhi Tourism. Galleries include Vadehra Art Gallery, Art Heritage, Triveni Art Gallery, Art Today, Sridharani Gallery, Eicher Gallery, Gallery 42, Dhoomi Mal Art Centre, Gallery Escape, Lalit Kala Akademi, LGT Gallery, Gallery Ganesha, Gallery steps, AIFACS, Max Mueller Photo Gallery, British Council Divisio Gallery, Gallery Romain Rolland, the Village Gallery and Khirkee Gallery. To get flight updates at Delhi Airport (Indira Gandhi International Airport Delhi), check the arrival and departure time of domestic and international flights. Delhi is a cosmopolitan city. Being the capital of India, people from every culture and every part of India are settled in Delhi.Following is the list of festivals. No matter which season you are planning to travel to Delhi, you may enjoy some festive season in India. Lohri is celebrated in Delhi, India in the month of January. People eat Jaggery, Peanuts and burn bonfire. Some people sings lohri folk songs as well. Republic day is celebrated throughout the country. There is parade by the armed forces. Lot of people gather to watch the parade and other cultural dances. Basant Panchmi marks the end of winter season in India. There is an old saying that aaya basant, pala udanth. Durga puja is celebrated during October-November time and mainly celebrated in Orissa, Bengal and Maharashtra states. Maha Shivaratri is the most auspicious night in Hindu Calendar. Lots of followers of Lord Shiva fast on this day. All the temples are decorated any Lord Shiva's devotees chant the Mantra Om Namah Shivay. Some devotees dring bhang as well. India got independence from British rule on 15th August, 1947. Prime Minister addresses the nation from Red Fort and lots of people gather around Red Fort to listen to the PM speech. It is a National holiday in India. It is the festival of lights. Almost everyone exchange sweets, gifts on this day. On this day, Lord Ram, Laxman and Mata sita returned home after spending 14 years in exile. All houses are lit with candles and diyas and it is a great view to watch so many lights. Lord Rama killed Ravana on this day. People gather in big grounds and effigies of Ravana, Meghnath and Kumbkaran are burnt. There are plenty of fireworks after that. On this day, Sisters tie band to their brothers hand and ask for their safety and long lives. It is the birth celebration of Lord Shri Krishna. All temples are decorated. It is the birthday of first Guru of Sikhs, Guru Nanak Dev Ji. Nagar Kirtans are carried out in the entire city. Eid festival is the most significant festival for Muslims all over the world. Eid festival is celebrated twice a year. The first festival of Eid is known as Eid-ul-Adha/Bakrid. Muslims sacrifice animals during Eid-ul-Adha/Bakrid. This ritual is mainly done to sacrifice the evil spirit. The second festival of Eid known as Eid-ul-Fitr is celebrated during the holy month of Ramzan. Muslims fast throughout this holy month of Ramzan and Eid is celebrated on the last day of the month. Muslims offer Eid prayers in the mosque. People embrace each other after the prayer. People go for shopping during the festival and gives gifts to relatives and friends. A special dissert Sewayian is made and served on this day. Make sure you always book your flights in advance. Most airlines have advance-purchase restrictions on discounted fares. By booking in advance, you are getting the benefit of discounted rates and you are getting fares in the low inventory classes. All airlines have revenue management systems. Airlines file the fares by class codes and farebasis codes. The sample airline booking class codes are Q,V,K,H,P,M,W,T,U,A,C,D,Z. Airline fares also depend on the routing. If you can travel via USA, fares will be cheaper. Traveling via USA requires that you be Canadian citizen or have a valid transit visa. Please check baggage rules if you are traveling via USA as most of airlines only allow 1 piece of baggage if you are traveling via USA. If you are traveling for a short time and can travel with 1 piece, you will save at least a few hundred dollars by traveling via USA. Nanak Flights has become a Global company now. We are now offering travel services to our USA customers. We have negotiated best rates with our USA Airline consolidators. We are passing all the discounts to our customers. Please call us for special fares on all Major airlines flying out of USA to India. Please watch our youtube video to learn tips on finding flights to Delhi. Airlines: Air Canada, Oman Air, Kuwait Airways, Emirates, Etihad airways, British Airways, Gulf airways, Delta airline, Jet airways, Lufthansa, Saudia airline, China Eastern, China Southern, Wow Air, Ukraine International, Austrian, Swiss airline. Fares from JFK/BOS/SFO/IAH/IAD/LAX/ORD to Delhi(DEL) departing January 22, 2019, returning February 11, 2019. Fares are subject to availability. We update our seat sale fares regularly. Please check our web site for most up to date seat sale fares. 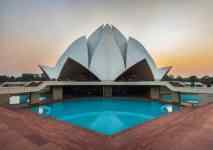 Fares from Toronto(YYZ) to Delhi(DEL) departing Februaryr 11, 2019, returning February 27, 2019. Book now. Fares are subject to availability. We update our seat sale fares regularly. Please check our web site for most up to date seat sale fares. 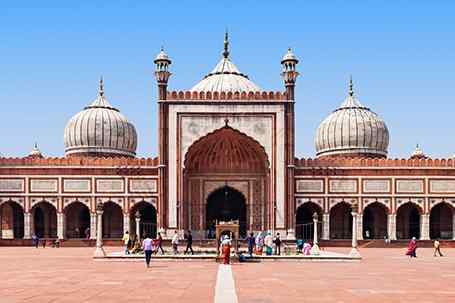 Fares from Vancouver(YVR) to Delhi(DEL) departing February 05, 2019, returning February 23, 2019. Fares are subject to availability. Customs:After you come out of the plane, you need to walk for few minutes and take the escalators down to the customs section. If you are a foreigner, You need to fill out a form with local address and contact details. Custom officer will stamp your passport. Baggage collection:After clearing the customs, you can proceed to get your bags. It is very close to the customs. Currency exchange:After collecting your baggage, if you want to get the Indian Rupees, you can get your dollars exchanged from either State bank of India or Thomas cook counter. For any information regarding Indira Gandhi international airport, Please visit the Indira Gandhi International Airport web site. Delhi Airport has started a new facility to the airport lounge. SAMS SNOOZE AT MY SPACE offers Sleeping pods and these are pay-per-use lounges, offering you personal comfort rooms, for the first time in India. If you have to catch the domestic connecting flight, Indira Gandhi International airport has a domestic wing for the connecting flights. Only Jet airways, Jet connect, King Fisher and Air India operates from the domestic wing of T3 terminal. If you are connecting via Spice Jet, Indigo and Go Air, you have to go to the old domestic terminal. It will take approximately 1 hour to travel between international airport to domestic terminal. Once you come out of the airport, Prepaid Taxis are available. The Taxi fare is pre-approved by the government and Taxi booth has a menu of fare for all the important tourist destinations and hotels in Delhi. You need to give them the complete address where you are going and booth clerk will give you two receipts. You are supposed to hand over the receipt only after you reach at the destination. Metro is very well connected to all the major points in the city. If you are a local and carry only 1 suitcase, you would prefer Metro option as it is the most affordable option to reach your destination. If you are a foreigner, You should prefer Taxi. There are few Air conditioned buses also available outside the airport. These buses are well connected to major areas of the city. Airlines flying from Canada and US cities or Gateways to Delhi(DEL). Few airlines connect through other cities in Western Canada. Jet Airways (operates 2 flights to Delhi. One flight is via LHR (London Heathrow airport) and other via AMS (Amsterdam airport)). Air Canada (connects via FRA, LHR airports). New***: Starting October 30, 2016, Air Canada's non-stop service between Toronto and Delhi will be offered daily. Flights are timed for convenient connections both within Air Canada's extensive North American network and in domestic India on Air India or other interline partners to such cities as Mumbai, Chennai, Hyderabad, and to other destinations throughout Southeast Asia. Please note that Air Canada operates Toronto to Delhi nonstop flights for 7 days Monday/Tuesday/Wednesday/Thursday/Friday/Saturday/Sunday. For Montreal to Delhi flights, Air Canada is also convenient choice as pax can take Air Canada domestic connecting flight from Montreal to Toronto and then to Delhi and vice versa. Ottawa to Delhi flights can also be travelled via Toronto hub. Customers can take Air Canada domestic flight from Ottawa to Toronto and then to Delhi and vice versa. Lowest fares from Toronto to Delhi can also be found using Billy Bishop airport(YTZ) on Air Canada, Qatar and Emirates combination tickets with Porter airline. Billy Bishop airport (YTZ), Toronto centre island is most convenient choice for Toronto downtown travellers going to Delhi(DEL), India. Travellers can save the traffic hassle of going to Pearson airport in Toronto and rather take flight from Billy Bishop (YTZ) airport. Search and compare flights from Toronto Centre island(YTZ) airport to Delhi and you might find save big money using this tip. Saudi airline connects via Jeddah. Saudi has 3 flights per week from Toronto(YYZ) to Delhi(DEL) on every Monday, Thursday and Saturday. Saudi has interlining with Air Canada from other Canadian cities Montreal, Edmonton, Calgary, Vancouver, Halifax, Winnipeg to Delhi Customers from Montreal, Edmonton, Calgary, Vancouver, Halifax, Winnipeg who are taking Saudi airline flights to Delhi will connect via Toronto using Air Canada domestic flight up to Toronto. Compare our split mix and match tickets on British airways and Saudi airline, Jet airways and Saudi airline, British airways and Jet airways split tickets. Combination and split tickets will save you hundreds of dollars on your flights. Lufthansa (connects via FRA airport). Austrian Airline (Operates the flight via VIE (Vienna airport)). Swiss Air (Operates the flight via ZRH (Zurich airport)). United Airline (United connects via US airports. Please check the visa requirement for travel via USA). United Airline allows 1 piece of baggage for Delhi flights. Etihad Airways (Operates flight by AUH (Abudhabi airport)). Etihad airways has 3 flights from Toronto to Delhi every week on Tuesday, Thursday and Saturday. Emirates Airline (Operates flight by DXB (Dubai international airport)). Emirates has 3 flights from Toronto to Delhi every week on Monday, Wednesday and Friday. Flights from Vancouver to Delhi connects via Seattle on Alaskan airline and then via Dubai to Delhi. Flights From Calgary to Delhi connects via Seatlle on Horizon airline and then via Dubai to Delhi. Get Free Hotel, Free meal, Ground transportation and visa fee if you book on Emirates Airline flight to Delhi and Transit time in Dubai is more than 8 hours and less than 24 hrs. Emirates provides free STPC/Stopover service on their flights to Delhi. KLM (Operates the flight by AMS (Amsterdam airport)). Kuwait airways operates flights to Delhi via LHR/CDG and connects via Kuwait(KWI) to Delhi. Kuwait airline ticket prices are lowest even during peak season. Air France (Operate the flight via CDG airport). For Ottawa to Delhi flights on Air France, There is bus service from Ottawa railway station to Montreal and then Air France Flight operates from Montreal to Delhi via Paris. Qatar Airways (operates the flight by DOH (Doha airport)). Qatar airways is the most convenient flight option for Montreal customers. For Montreal to Delhi flights, Qatar connects via Doha. Qatar is also #1 choice for Amritsar flights as you receive your baggage in Amritsar. Custom is also done at Amritsar airport for Amritsar flights on Qatar airways. British Airways (operates the flight via LHR airport). Air India (connects via LHR airport). Turkish Airline (connects via IST airport). American Airline (connects via USA and LHR airports). Finn Air (connects via HEL airport). China Eastern Airlines (connects via SHANGHAI(PVG) airport). For Vancouver to Delhi flights, China eastern is very convenient choice for our customers with less connections. For Calgary to Delhi flights, you can go to Vancouver hub using Air Canada or West jet domestic connections and then use China eastern to Delhi and vice versa..
China Southern Airline is the most preferred Airline for Vancouver to Delhi and from Calgary to Delhi flights. You can also buy China southern and China eastern combination tickets to Delhi. Calgary to Delhi flights connect via Vancouver hub. China Airline is very convenient choice for Vancouver, Calgary and Edmonton customers for Delhi flights. If you are planning to stay close to the Airport in Delhi, following is the list of the best hotels close to the Delhi Airport.